Brazil is a classic choice, because we love their style of play and they had long dominated the game. We loved Pele back then as much as we love Neymar now. Jamaicans and many other Black countries also supported Brazil because they see themselves in the players. Since its inception, the Brazilian national team has always featured black players performing excellently on the world stage. It’s no wonder that we find ourselves so attracted to them. Their team has consistently made the game a wonder to watch, with their rhythmic passes and fabulous goals. 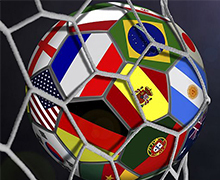 Few of the European teams this World Cup – Spain, Germany, Belgium, France – have die-hard supporters. Their fans in this country are what we call ‘wagonists’, with that acute tendency to cling to the bandwagon once a team is enjoying success. England brings a lot into question for us. Most of us shudder at the thought of supporting our former colonial overlords. But with the team having many players of Jamaican origin, some of us see it as essentially Reggae Boyz 2.0. It becomes more complicated when one realises the disproportionate amount of blame hoisted on black players for the team’s mistakes. One extremely racist England fan has even gone so far as to say he can’t bear supporting the team because it has too many black players. Let’s affirm the politics of football just as we accept the fact that the ball is round. No one should be able to dismiss this game as just as sport. In the case of Brazil, confronting our politics means realising we enjoy seeing players who look like us, and are valued and respected for their talents. Politics doesn’t have to be as displeasurable as the people involved in it.